If you love Chick-Fil-A and (especially) love eating free, then this Friday is your day! 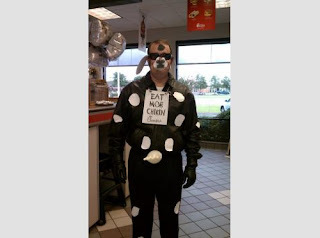 July 13 is Cow Appreciation Day at all Chick-Fil-A restaurants. Anyone, of any age, who shows up looking like a cow gets a free meal. In the past, my kids and I have simply worn white pants and t-shirts with cut-out black construction paper spots taped to us, with construction paper "cow ears" taped to our ears and black painted noses. That is about as simple as it gets. This year, CFA makes it even easier with these printouts. Although you think you may feel silly (and you will), there will be so many others at CFA that day that look even sillier than you do; trust me. And you make really fun memories with your kids in the meantime. What if you don't have kids to take with you? Go anyway. Grab some friends and eat lunch together. Just make sure to take pictures and feel free to send them to me. I'd love to feature them on this blog!